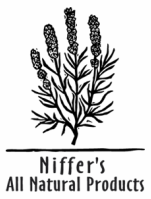 Niffer's All Natural has closed. Thank you so much for all the years together. Orders will be taken until December 9th. After that I will be closing Niffer's shop. It has been such a wonderful 6 years, thank you everyone for supporting this small business! "Excellent, friendly service and great quality products. Her antiseptic balm is amazing. Gets my poor cracked chapped lips through a cold, dry Canadian winter!" - Christy S.
"I won't use any other bug repellent than Niffer's!" - Ashley S.
"I am writing this from a trip to South China where it is hot and humid. I brought these travel packs along with me and they are fantastic!!!! Way better than Woolite. The clothes actually get clean ( I am hand washing them and using some light weight gloves just to keep my hands soft). Woolite left the clothes smelling slightly sweaty. These took all the grime and sweat out and left everything perfect! I will bring these with me from now on! Thank you! - Rand B. "I must say that after washing all my bedding in your All natural Lavender Laundry Powder, laying in bed is amazingly relaxing! Love this stuff. Good night" - Melissa M.
"This stuff is awesome. I am a stay at home dad and do 98% of my family's laundry and I can honestly say I don't think our clothes have ever been cleaner. Super gentle on the baby's skin, I love it and will probably use nothing else from now on." - Barry H.
"Wow! This stuff is amazing! The smell is exactly like I expected, if not better! I am on load three and everything comes out smelling great and my clothes feel a lot softer! Working at a vet's office, my scrubs get pretty nasty and they came out looking great! I'm hooked!" - Catie J.